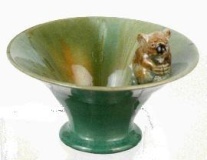 19 (Early Series) Flaring open conical bowl with foot, and koala decoration. 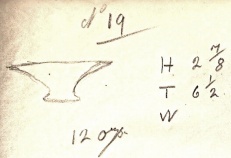 Dimensions; height 11 cm, diameter 15.5 cm. The base has been ground, leaving the inscription faint and fragmentary, hard to read. However there is no sign of the expected suffix 'B' to denote the applied koala. 19 (Early Series) TWO SHAPES. This appears to be one of those numbers that was re-assigned to another shape during the course of the Early Series. Does this shape appear in other series? No, not in other series, but examples are recorded elsewhere in the Early Series at Early Series 4. The reason for this duplication is unknown. Only a single example is recorded numbered 19 whereas there are several numbered 4. The use of the size suffix S suggests that another size may have existed. It is possible that 19 is just a numbering mistake. Mistakes did happen - see the 'Pitfalls' page. The height dimension here is less than the example above. More like Early Series 22, a similar bowl but with a ruffled rim.